I had a set back with the self portrait this week. I worked for almost two hours doing the final construction of the sky piece and then I decided it looked like crap. Arg. 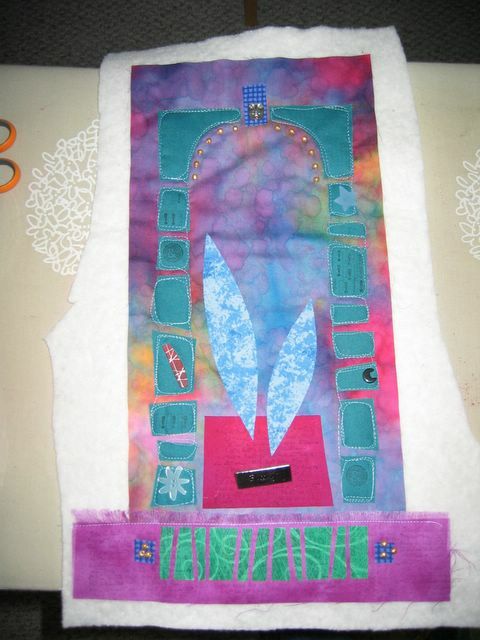 This is a piece of fabric I hand painted, then measured over and over, quilted, beaded, shaped, pillowcased, pressed…. And then looked at it. Yuck. The shape just doesn’t really say what I wanted it to. The color doesn’t keep up with the rest of the quilt. There was a time in my art-life that I would have pressed on with it. But, I really want to learn some things from this project and I know I need to come up with something better and “trash” this sky piece. (Of course by “trash” I mean put it away until it finds a better use.) I’ve got some ideas and I’m going to make some sketches, but I think what I really need to do is move on to another project for a bit. One of the big challenges with this sky piece is that it must accomodate a 5 inch sleeve. And I want to leave those two triangles on each side of the "roof" empty. So that means I can't do exactly what I want... not that I know what I want, but this sleeve requirement is annoying me. I started working on this instead. I was inspired by a collage in Paper Quilting by Bridget Hoff. I just love that arch/portal shape. I'm going to do more embellishment and hand stitching then zig zag the edges. 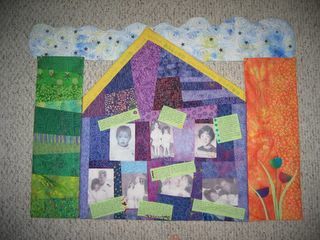 I'm so pleased with it I think I might make another of the very same layout in a different color scheme. Muddy batiks maybe. I haven't been by in a few weeks...you've been busy! It's always disappointing to decide that something isn't working in a piece, but my experience has been that when I've ignored my gut and pressed on, I always regret it. BTW, I like the way you left the straps, etc on the clothes you used in Claire's quilt. Deborah, I really love the self-portrait. I ran across a photo of myself this morning of me when I was in the 3rd grad and thought about your quilt. I have several photos on fabric but I really want to do something different and unique by way of layout. Have a productive week...can't wait to see the portal finished.